← Improvements to the Glen Canyon Park Playground? As our readers will know, we’ve been concerned about the use of second-generation rat poisons that cause death by slow internal bleeding. The poisoned mice and rats are likely to be captured and eaten by other animals – owls, coyotes, dogs, cats, hawks. 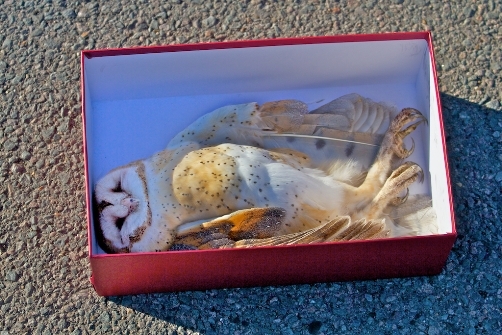 When this happens, they can get poisoned too, and we’ve seen two owls die this way: a barn owl and a Great Horned Owl. These poisons are currently available in stores, and anyone can buy and use them – without knowing they could harm wildlife, pets, and even small children who pick up the bait by accident. These are the products that the US EPA concluded (way back in 2008) pose an “unreasonable risk,” and tried to remove from the consumer market. The active ingredients affected by the DPR decision are brodifacoum, bromadiolone, difenacoum, and difethialone. If this is an issue you care about, please send them an email of thanks. We’d also like to thank all the organizations that have been involved in trying to get these restrictions, and all those that have campaigned against these rodenticides.